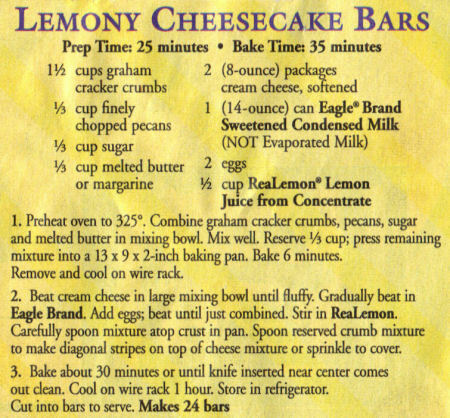 This promo recipe was clipped from a magazine and found in a large collection, date unknown. I’ve typed it below along with a scanned copy. Preheat oven to 325°. Combine graham cracker crumbs, pecans, sugar and melted butter in mixing bowl. Mix well. Reserve 1/3 cup; press remaining mixture into a 13x9x2-inch baking pan. Bake 6 minutes. Remove and cool on wire rack. Beat cream cheese in large mixing bowl until fluffy. Gradually beat in Eagle Brand. Add eggs; beat until just combined. Stir in ReaLemon. Carefully spoon mixture atop crust in pan. Spoon reserved crumb mixture to make diagonal stripes on top of cheese mixture or sprinkle to cover. Bake about 30 minutes or until knife inserted near center comes out clean. Cool on wire rack 1 hour. Store in refrigerator.